A data courier, carrying a data package literally inside his head too large to hold for long, must deliver it before he dies from it. The foundation of cyberpunk in movies - to me at least. I must have watched this on VHS 20 times as a kid, and now I finally got around to buying it (used) at my favorite online DVD-store. This was ground breaking sci-fi and revolutionary cyberpunk within movies when it came out in 1995. 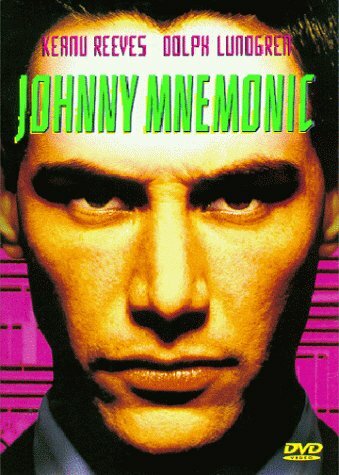 The plot is loosely based on the short story also named Johnny Mnemonic from 1981 by William Gibson. You can get this story in the book Burning Chrome which is a collection of Gibson's short stories from 1977 to 1991. I have not read the book yet, but after seeing the movie again, I went online and ordered it right away. The structure of the plot is simple but solid; smuggler gets important cargo, everyone wants the cargo, smuggler does not want the cargo but ends up saving the day. Classic, solid and good. Keanu Reeves does a good job in this movie, and in many ways this must have been a prelude for The Matrix for him. There really is not that big a difference between the two roles. The Yakuza and PharmaKom are played by a Japanese and a Chinese guy respectively, and this gives a rather good cultural tension which is acted out in their parts. Great! Dina Meyer playing Jane, is rather bland. Dolph Lundgren playing the Street Preacher is quite scary and he is casted perfectly for this part. Despite having a small part and delivering an average performance, I still think Henry Rollins is great as Spider. The effects are high end for their time. The animations of the Internet, cyber fight etc. are nicely done and really gave a great impression back in 1995. I have recently started playing the RPG Shadowrun, and for me this movie has millions of references to the game. F.ex. Johnny's job is actually referred to as "a run". The first edition of the game was released in 1989, which is 5 years after the short story but 6 years before the movie. the two really go well together, and if you need inspiration for the mood etc., this is the movie to refer to. Watch this movie if you like sci-fi, cyberpunk or Shadowrun. It is really a cornerstone.